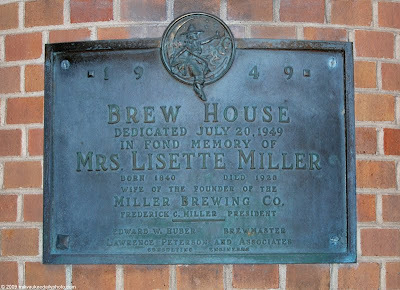 About 60 years ago, the main Brew House at the Miller brewery was built... it still houses the huge kettles that boil the wort and begin the process of turning grains into beverage. You can see the inside of the building on the brewery's tours, along with the bottling and packaging operations at the plant. The Milwaukee Theatre has a great entryway, with lots of decorative metalwork and large, spiked spires rising from the roofline. 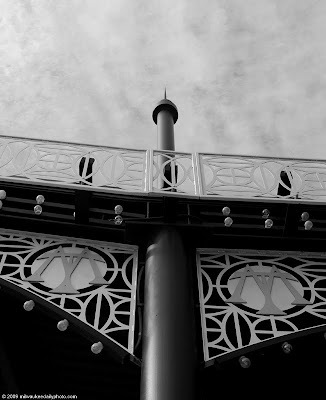 The spires reaching for the sky grabbed my attention when out shooting, and the result is today's photo. With the end of summer, it's time for bowling leagues to start around town. Tonight, we bowled in our league for the first time this season. 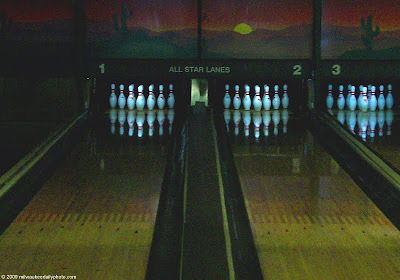 All Star Lanes, on 105th and Silver Spring, is where we go. It's a chance to get out of the house, see friends, and have fun. After all, what other sport has a waitress to bring you your favorite beverage and snack? 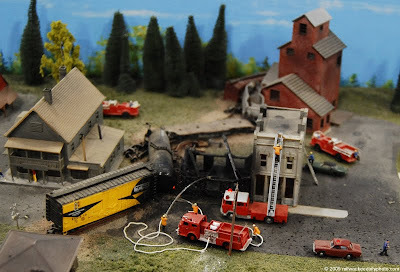 Fortunately, this accident never really happened... it's a model from last years' Trainfest. This year's show will be on November 14th and 15th at the Wisconsin Expo Center. For more information, visit the Trainfest website. 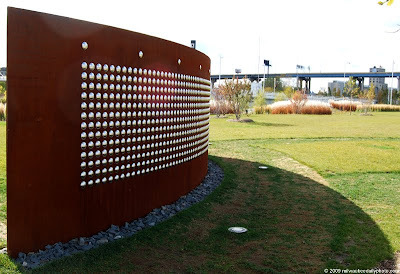 At the Harley Museum, you can purchase a stainless steel rivet that is attached to one of two large curved sheets of steel. People buy them to commemorate special events, friends or loved ones, and you can lose yourself for quite a while reading them all. 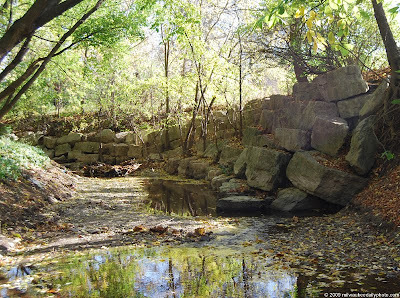 When the Kinnickinnic River was low, I was able to get this photo showing the rocks that had been placed along the riverbank to protect it from erosion. We're finally getting some much needed rain, and the river should be rising soon. 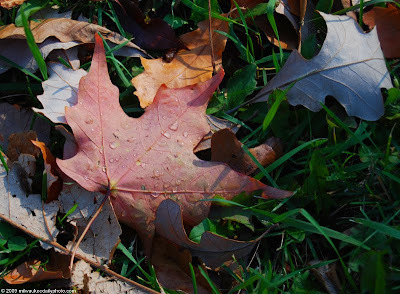 As we enter fall, plants want to reseed themselves, and are looking for transport. 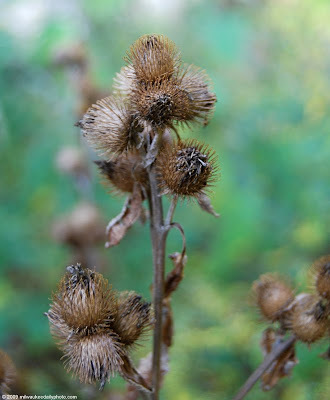 These burrs attach themselves to your clothes or your furry four-legged friend's hair and are carried elsewhere. Not necessarily the most popular method (to us), but effective none the less. Sometime early this morning, it became Autumn. I'm looking forward to it - the cooler temperatures, changing colors, and all that it has to bring. 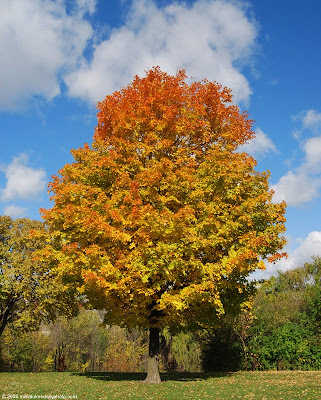 Today's photo is from the Kinnickinnic Parkway... have a great fall! 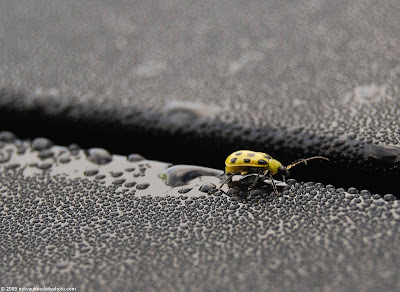 As I was preparing to load the car, I noticed this bug walking across the dew that had accumulated overnight. Fortunately I had my camera, and was able to get a few shots of him walking across the surface and disturbing the tiny droplets. Yesterday was the 9th annual Milwaukee River Challenge, a rowing competition attended by over 600 participants. The 3-mile course started and headed east on the Menomonee River, and turned north onto the Milwaukee. 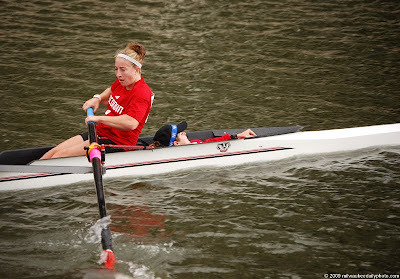 In today's photo, the ladies of the University of Wisconsin are in the lead and headed to win their heat. The coxswain is reclined in the front of the boat, directing the rowers and urging them on. The scoresheet shows a sacrifice fly in the bottom of the eighth inning by Prince Fielder. For those of us there, and those watching on TV, it was a moment for the record books. 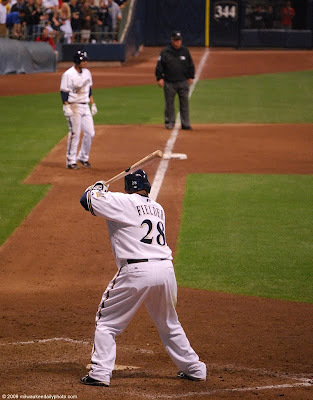 By driving in Felipe Lopez, Fielder set a new club record for runs batted in in a season with 127. Opposing manager Cecil Cooper, the prior holder of the record, had a unique vantage point for the event from the Astros' dugout. 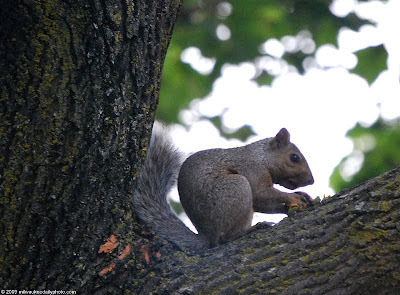 The large walnut tree across the alley from us has begun to drop its nuts, and the neighborhood squirrels have been busy picking them up and stashing them all over. One of them took time out to spend some time up in another tree and making a snack for himself. 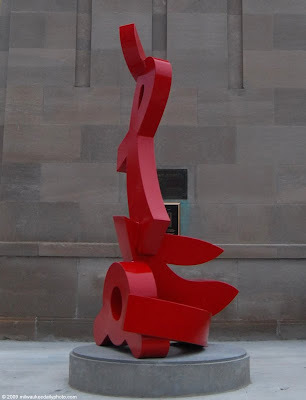 "... 'Guide,' appropriates the names of Milwaukee landmarks to create an homage to the persistent, yet fickle need that humans have to memorialize." I have to admit, I don't have a clue what some of the things on this list are... but I'll be looking into them, and hoping to get photos for you! 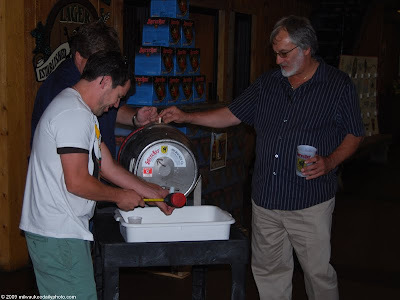 The moment we went to see last night at Sprecher was the tapping of the Firkin representing the first of this year's batch of Octoberfest beer. After driving a hole into the bung in the top of the barrel to release pressure and allow air in, the tap was driven (as seen here), and a spout added to the tap. The delicious golden brew soon flowed, and a line quickly grew to sample the beer. Beer Week in Milwaukee is in in full swing. This evening, we went to Sprecher Brewing to attend the release party for this year's batch of Octoberfest, a tasty amber brew. 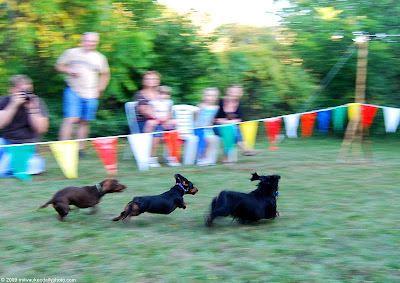 Part of the festivities included Dachshund races. I was really surprised at how fast those little legs can go, especially when there's food at the finish line! 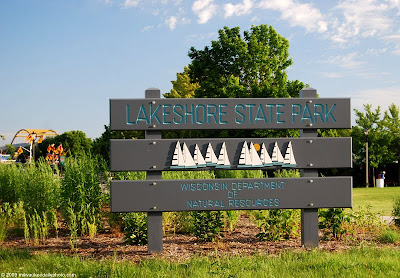 This sign at the north end of Lakeshore State Park welcomes visitors to our local park. With its beach area, walking paths, and docks for boats, it's a great compliment to the area. 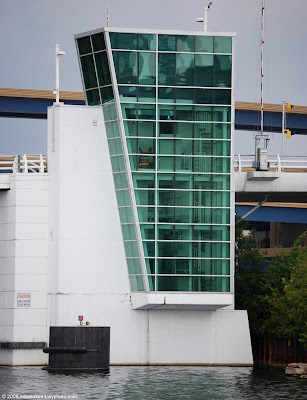 The Hoan Bridge with its bright yellow arch can be seen in the background. 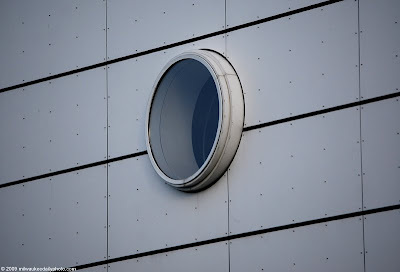 If you look at this photo of the side of the Discovery World museum, you'll see one lonely round window. Today's photo is a detail shot of that window and the surrounding wall. One of the buildings in the Sidney Hih complex. 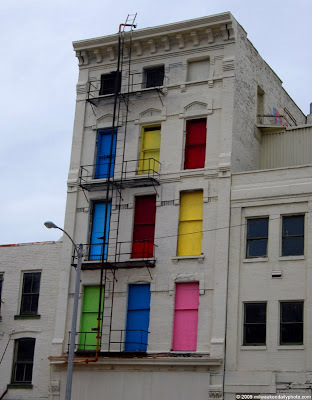 While I think the painted windows are not the greatest, the colors certainly make it more tolerable. I've featured this work before, but it's so large and varied in it's structure that it's worth a revisit. The layers upon layers of wire that are used to build the frame have rusted over time and given a great look to the piece. I'm not quite sure what this is. 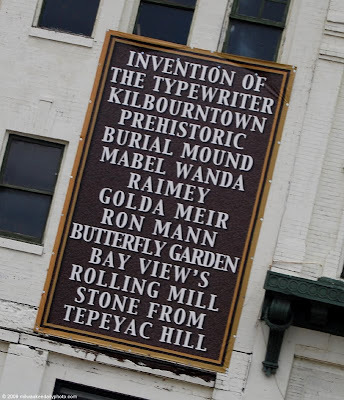 I do know that it sits atop a decorative arch on the west side of the riverwalk between Wisconsin and Kilbourn. 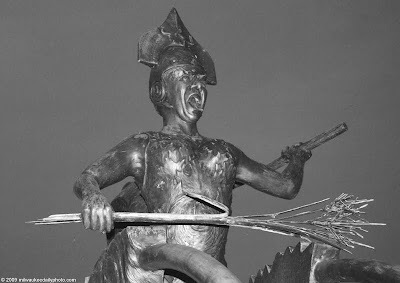 I've featured this statue before, but it's time for a revisit based on some recent news. 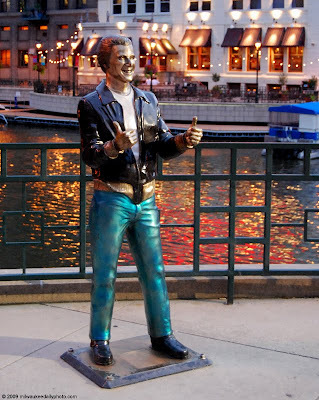 Visit Milwaukee has been honored by National Council of Destination Organizations for their "Bronze the Fonz" project, which raised $17000 for a literacy program at the Boys' and Girls' Club. I guess it's good for the community, even if somewhat stereotypical and not popular in the eyes of some. Now that all the local school districts are back in session, Mother Nature is wasting no time in reminding us that fall is ready to begin. Some of the trees are already turning brilliant colors and dropping their leaves, providing me with another item to add to my to-do list. This afternoon, I noticed that the bird bath in our backyard was devoid of water, probably as a result of the warm, dry weather we've had the last week. 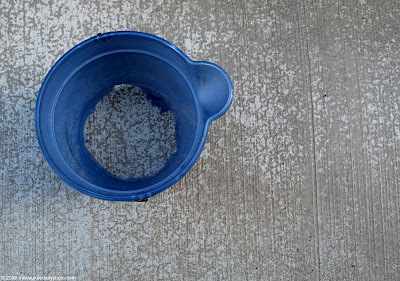 I grabbed the trusty cheap plastic bucket next to the garden hose, filled it up near full, and took two steps. The bottom of the bucket broke out and drenched the patio (along with my feet). Apparently, the sun did a job on the plastic as well. I've featured the work of sculptor Richard Taylor before. 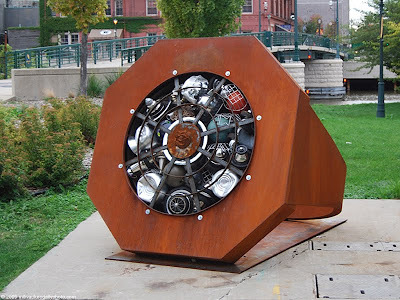 Today's photo is of his sculpture on the northeast corner of the Kilbourn Street bridge. The name of the piece escapes me, but its collection of iconic shapes and figures and bright red color really catches your eye. Every five years, Harley-Davidson has its anniversary celebrations in Milwaukee. 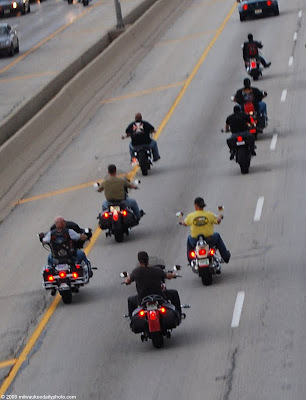 On the off-years, the Milwaukee Rally is held by the area's Harley Dealers on Labor Day weekend. The bikes are running around town in force, and it's a perfect weekend for a ride. One more piece from John Ready. This one, called "Octagon Ring", again uses found objects as the jewels in a very large piece of jewelry. As we enter Labor Day weekend, the unofficial end of Summer is in sight. As it gets cooler, the opportunity to get outside and enjoy outdoor activities. 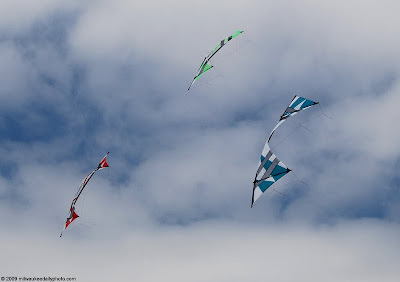 These stunt kites at the lakefront will probably hang in there, waiting for those blustery fall days ahead. 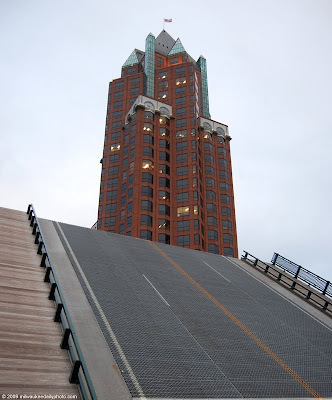 The west end of the Kilbourn Street bridge is open to let a boat pass, with the Wisconsin Center building and its distinctive roof line in the background. 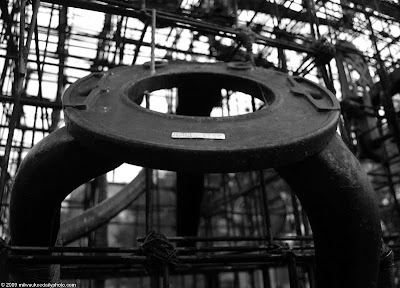 Today's photo is of a BIG ring, created by John Ready (the same artist as yesterday's photo). 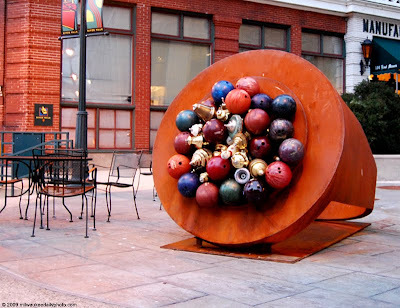 The piece, "Round Ring", contains bowling balls and pins and shiny, brass-like pieces. It's located at the river and the intersection of Mason Street.